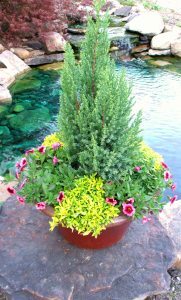 Due to it’s relative ease and efficient use of space, one of the most popular forms of gardening today is the practice of planting into containers. Because of the simplicity involved in moving and caring for the pots and their contents, containers make it easy for anyone to enjoy plants, anytime of the year. Containers allow for the arranging of several different plant and flower species together, creating a beautiful display of plants across a wide palette of colors. Not only used for flowers, many people who do not have the space for a full-sized backyard plot grow a garden’s worth of vegetables and greens in containers. Herbs do especially well in containers, even when kept indoors the entire season. At Andy’s we can design and plant a container to fit your space, whether indoors or out. We have a great selection of containers to choose from and we will do our best to help you find one to suit your needs. If you have containers at home, we will plant them here or come to your home or office. Proper soil and fertilizer will help get your instant garden off to a great start! Schedule deliveries for Monday through Saturday. We deliver plants and bulk material. For questions about this service including scheduling and fees, please contact us at: 205-824-0233.